Think Outside the Envelope. Colorful Graphics with Digital Envelope Printing. Digital envelope printing devices utilize high-speed inkjet and toner technology for full-color printing, variable data, and lower operating costs. Print providers that invest in a digital envelope printer look for specific functions like automatic loading, high speed, and multiple job processing. Before selecting a solution, it’s important to consider intended media types and material thickness. Above: Printware’s offering of the iJetColorPro is a light, industrial envelope press that uses a vacuum conveyor system. Envelope printing evolved to reduce pre-printed envelopes and logistical challenges while promoting full color and short runs. This is partly due to the success of digital envelope printing. Traditional envelope printers featured windowed and pre-printed envelopes, which are often associated with challenges like high inventory and warehousing space. 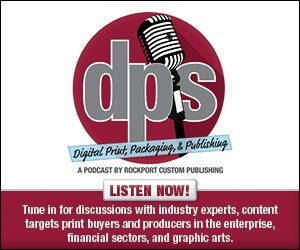 The onset of digital print technology introduced a just-in-time manufacturing approach with the ability to print short-run envelopes and labels with colorful graphics at high speeds, comments Bill Papp, product manager, Document Data Solutions (DDS). “Recently, higher speed inkjet technology was introduced to provide real production capacity at a significantly reduced operating cost and duty cycle exceeding 2,000,000 per month,” he explains. Papp points out that digital print technology offers the ability to produce personalized graphics and mailing addresses on plain white, closed-face envelopes inline with processing equipment. Inline digital envelope printing streamlines workflow and eliminates waste at higher speeds all while offering four-color printing and variable data. For example, inline devices print addresses in zip code order with the appropriate Intelligent Mail Barcode as mail inserts—allowing large mailers to comingle jobs and take advantage of postal discounts without added expenses or offline sorting, shares Papp. Additionally, the direct mail market has made a comeback—demonstrating strong growth in one-to-one communications—with the use of variable data, says Oostveen. It’s often used by retail companies to display targeted messaging on the envelope—resulting in higher attention value and conversion rates. Compared to traditional solutions, digital envelope printers offer advantages including the ability to use variable data, an on demand printing process, inline capabilities, and lower operating costs for short runs. Digital envelope printers also provide immediate advantages like relevant messaging with variable data, lower operating costs, and greater security using closed-faced envelopes. In fact, Bruce believes inkjet printing eliminates the need to use anything other than plain white envelopes. “You can personalize messages down to each individual envelope. With high-impact color and graphics, your mail piece delivers a great first impression before it’s even opened,” he offers. Digital envelope printing equates to personalization and customization—the ability to print variable data, variable images, and quick response codes. “Plus, digital technology can accommodate smaller print runs economically. There are no setup charges involved, no waste, and jobs are printed quickly due to the mechanics of digital technology,” says Verwey. Compared to offset devices, digital envelope printers benefit from shorter run sizes. “The high cost of plate changes in both material and labor add up quickly,” admits Papp. In addition to cost effectiveness for short runs, these devices also yield high personalization at speeds of over 25,000 envelopes per hour. “It’s about being more competitive in the marketplace by providing better pricing and faster delivery while increasing profits, particularly on short-run jobs,” he adds. When dealing with multi-color envelopes, suitable job sizes are typically one to nearly 100,000. After 100,000—unless there is a variable data component—the advantage shifts back to offset. “Because of this, shorter run jobs can be run per shift yielding more profitability for the printer,” says Andrew Schipke, VP, sales & marketing, W+D North America Inc. The printer can also fulfill orders quickly and respond faster to time-sensitive jobs. In addition to advantages over offset technology, inkjet envelope printers compared to toner devices offer the ability to print over non-flat finished surfaces like seams or embossed paper, adds Schipke. Unlike toner technology, inkjet is a non-thermal process that allows print providers to use traditional, low-cost window films. Despite its advantages, digital envelope printers have their fair share of challenges in regards to media, feeding, printability, and print quality. “Envelopes are different because they are made with four or more layers of paper, thickness varies all over the envelope,” shares Verwey. Several common envelope challenges occur with cuts, folds, glue, flap adhesive, paper dust, and twisted materials. “It can really cause a fit for mailers. Most printers are designed to handle cutsheet or roll paper with a nice, flat, and even surface,” admits William J. Longua, senior director, Neopost Digital Print Group. It’s important that envelope printers can feed and print on challenging items. “They have to be flexible and forgiving,” says Longua. For example, some digital printers handle a range of materials from three-inch coin envelopes and 10×13-inch flats to 10.5×16-inch padded mailers. Additionally, integrated feed systems exist that are designed to quickly separate and feed envelopes into the print engine in the most efficient manner, all while holding registration and being top-loaded so production can continue with minimal stops. “Media is a substantial challenge to profitable envelope printing,” agrees Tim Murphy, president, Printware Mfg of iJetColor. That is why digital envelope printers are robust and allow a wider range of stocks, thicknesses, feeding methods—friction bottom roller/vacuum table—and adjustable printhead heights to handle media up to one-inch thick. “Research the capabilities of dedicated envelope presses and compare variable costs, speed, and capabilities,” he recommends. Envelope thickness—not only in variable production mode—and envelope quality comes down to substrate choice. “Inserting machine manufacturers have modified their inserting machine with an adjustable transport section that compensates the thickness,” says Oostveen. In the case of inkjet printing, he believes this is especially important in order to have the proper distance between printhead and substrate. In addition to challenges, digital envelope printers also have limitations that need to be improved to match rivaling technology. For example, not all colors will translate to a CMYK inkjet process—especially on uncoated paper. To accurately match colors, Schipke says print providers need a fifth spot color station or the ability to change paper to a treated or coated inkjet substrate. “This may not work for a variety of technical and cost reasons so it’s critical that you understand the color gamut of the inkjet press you are looking at and your customers’ demands,” he cautions. Those successful with a CMYK inkjet process typically change how they sell print. Schipke says these providers optimize prepress, RIP, and color software for a range of papers and substrates that fit the cost and needs of the customers. On the other hand, he believes inkjet printers are much faster, but they require a porous substrate—or one that is inkjet pre-treated—so the ink dries quickly upon printing. This is the main limitation on an inkjet device, which affects its suitability for some applications. “Obviously, the pros far outweigh the cons for both of these technologies because they are very successful in this market,” adds Longua. According to Joe Bondonna, product manager, Spiral Binding Company, Inc., the bottom line is that offset print technology still offers the best print quality. “Provided the end user’s volumes justify the large print runs required to make offset pricing reasonable, which is still the preferred method.” However, he adds that the ability to add short-run marketing information to a customer’s mailpiece can outweigh the advantages of offset envelope printing. Print providers seeking a digital envelope printer look for specific features like multiple job processing, intelligent inserting, and a low cost of ownership. Verwey suggests features like a feeder that is easy to set up between different sizes of envelopes or even flat sheets, Pantone matching colors, variable data at rated engine speed, straight paper path, and a fifth color option are in demand. A high-speed envelope print system requires a workflow that automatically loads and processes multiple jobs without stopping. “The ability to group print jobs together allows the operator to load several hours of productions with a couple of mouse clicks,” says Papp. Solutions are available with automated workflow options including the ability to accept ICC color profiles for adequate color reproduction. The type of envelope affects the print technology that the print provider chooses. “The provider must ensure that the printer will be able to print on all the types of envelopes the customers will request,” advises Mark Priede, VP, sales and marketing, Xanté. He suggests toner-based printers are ideal for most paper-based substrates. Because customers often require different envelope sizes, the ability to quickly and easily switch between sizes is also important. “Look for a digital printer with an efficient and simple feed system that accommodates as many envelope sizes as possible. Question the manufacturer about the exact amount of time required to switch sizes,” recommends Priede. A variety of digital envelope printing solutions are currently available. Finding the right solution depends on the device’s features and its media capabilities. BlueCrest offers the Print + Messenger color inkjet inline printing system. With a maximum 4.25-inch print width, it relies on HP Thermal Inkjet 4 printing technology. Dye-based inks offer vibrant images and high-quality native barcodes without the use of a dryer. The device also features CMYK, variable envelope thickness, built-in composition tools, and PDF workflow with the Print + Composer. The Print + Composer software merges address and postal data, marketing messages, and images to create dynamic envelope content. Bruce says the full printing system supports a range of production job sizes. DJM Inkjet Solutions provides the HP Color Print Module C500. The device handles widths up to 4.25 inches and offers the ability to add color images, graphics, and variable data to envelopes and documents. The device operates up to 500 feet per minute and features a modular design to easily integrate with existing equipment and workflow. According to Oostveen, the HP Color Print Module C500’s automated service helps it stand out from the competition. The DDS iDataPrint ColorSpeed C500 offers a 4.25- or 8.5-inch print width on any envelope size. Utilizing HP inkjet technology, it performs automated printhead cleaning and maintenance, various workflow options, standard ICC color profiling, and optional print verification. The device is designed for an output of up to five million envelopes per month. Papp says the iDataPrint ColorSpeed C500 is available for $163,000 including 4.25 inches of CMYK color print, ink delivery, and print controller. The Neopost MACH 6 utilizes 1,600 dpi Memjet thermal inkjet technology to handle envelopes up to 10.5×16 inches with a 3/8-inch thickness. It features full-color output and a full bleed to handle average production sizes from 25,000 to 50,000 envelopes per month. According to Longua, the device’s color output exceeds 8,000 envelopes per hour while offering all-metal heavy duty construction, a color touch screen, job storage and recall, adjustable thickness control, and a 500 plus envelope capacity top-loading feeder. Pricing starts under $20,000. OKI Data’s envelope presses feature a straight paper path, easy set up feeder, LED technology, and a fifth color option. Printware’s iJetColorPro industrial inkjet press is a high-speed, light industrial envelope press that prints full-color filled or unfilled envelopes of various sizes and shapes for volumes targeted at 1,750 to 7,120 variable images per hour. The device uses a vacuum conveyor system to deliver products for personalization, text, and imaging. It utilizes a Memjet-based VersaPass component and handles print widths up to 8.7 inches. The system incorporates leading color management tools, workflow, industrial touchscreen operation, and supplies from Printware. According to Murphy, the iJetColorPro is available for under $60,000. Spiral Binding offers the iJetColor Press Performance Bundle, powered by Memjet. It handles media up to 9.5×17 inches and produces 4,700 envelopes per hour. The bundle includes everything print providers need to print four-color personalized envelopes, direct mail, and short-run letterheads including iJetColor RIP and Workflow, iJetColor Spot Color Matching/Correction Software, and iJetColor Variable Print Utility. Bondonna estimates that users receive a return on investment in 12 months by producing as few as ten orders of 1,000 envelopes per month. MSRP is $24,995. W+D offers a portfolio of inkjet technology for various envelope mailing segments including the W+D Halm i-Jet inkjet envelope press in the envelope overprinting market. The device handles sheets and envelopes up to 15×18 inches and utilizes production class Memjet CMYK+ technology. Its engine offers 1,600×1,375 dpi with a production size of over six million envelopes per year. W+D Halm i-Jet produces 32,000 envelopes per hour at high resolutions. The Xanté En/Press Multimedia Digital Press is an electrophotographic envelope printer that handles sizes up to 13×49.6 inches. It prints up to 4,000 envelopes per hour and offers 4,800 dpi. The digital press includes a patented Enterprise High Speed Feed System and iQueue Workflow. It also supports heavy media up to 18-point thickness and includes PlateMaker 8 technology for printing on polyester plate media. According to Priede, the En/Press Multimedia Digital Press is available through Xanté direct sales or the company’s global network of independent dealers. Established in 1976, Modern Postcard is a high-quality print and direct mail marketing provider based in Carlsbad, CA. The company serves the mailing and addressing industry—offering direct mail, data and lists, marketing and design, and custom solutions. The print provider originally used a toner-based device for its envelope printing but felt it was limiting its capabilities. In July 2015, the company sought a solution to remain competitive and produce high-quality, customized envelopes in house, at an affordable cost. Soon after it selected the Memjet-powered iJetColor Press from Spiral Binding. The iJetColor Press is a complete digital color print solution that handles up to 4,700 envelopes per hour at a maximum 9.5×17-inch width. With this device, Modern Postcard prints full color with variable data in one step at 1,600×1,600 dpi. It provides the company with the ability to print full-bleed, windowed envelopes. “When it came down to make the final decision on quality, purchase cost, and actual total cost of ownership, the iJetColor Press came out on top,” says Keith Goodman, VP, corporate solutions, Modern Postcard. Before investing in the iJetColor Press, printing graphics and variable data on an envelope was a two-step, two-machine process for the print provider. A minimum quantity was required to justify setup time and cost-per-piece was high. Outsourcing the job could take seven to ten days. After utilizing its newest press, Modern Postcard prints personalized messages and addresses using the same machine in a single pass. Its faster setup time allows the company to take on smaller projects that still make financial sense with no minimum quantity. It also produces high-quality graphics in house, on demand, with a four-day turnaround. “The iJetColor Press has given us the opportunity to run medium-sized jobs without burning out the unit because of the durability and the speed. We can knock out a medium-sized job in a day. The printer paid for itself in four and a half months,” offers Goodman. Modern Postcard ultimately purchased the iJetColor Press to print better quality customized envelopes in house, which led to a 50 percent decrease in turnaround time and a 50 percent gross margin increase compared to outsourcing. Envelope market segments like direct mail and transactional billing benefit from the use of digital envelope printers. These devices evolved with high-speed inkjet technology—allowing print providers to create full-color envelopes with variable data.